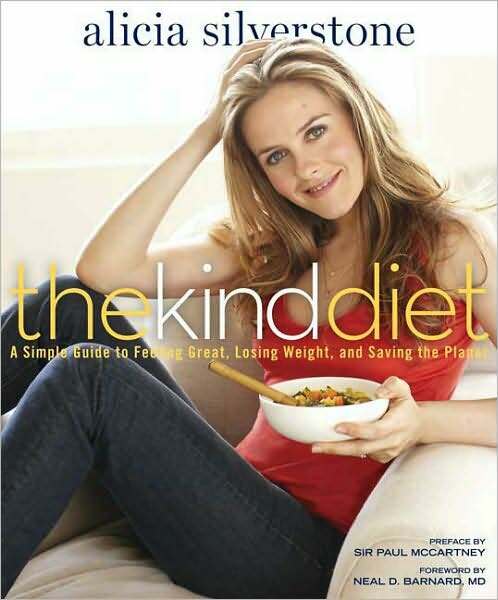 I still haven't had time to upload my pics from this weekend, mostly because I spent last night flipping through Alicia Silverstone's relatively new book, "The Kind Diet". It's a really well written and lovely book - she did a wonderful job with it! Many things I already knew, and I'm already a firm believer that with all of the processing, hormones & other crap that's put into our meat/dairy products today, that adopting a vegan diet is the healthiest way to go. I personally was vegan for 9 months before I turned Pescatarian (a veggie that eats fish every now & then). She really does a great job of outlining the health benefits, the truth behind what we consider "healthy", and "food" - and creates a simple breakdown about how to change your life and the way you perceive your diet. It's all accompanied by super cute photos of her and her hubby (I totally love that stuff), and ridiculously yummy-looking recipes. I may have to get a copy of my own, as I just rented it from the library. Some of the recipes sound WAY too good to avoid.... even though some ingredients are a little crazy-sounding (a lot of the Asian veggies that I've never heard of), I'm certainly willing to give them a try! Here's a link to Alicia's blog for more info & fun stuff. I love her perspectives on food, animals, and the environment. She's quite a gal! A Campin' we will go! Film on the Rocks - "SPEED"
BEST Vegan Shells & Cheese! Memorial Day Weekend - Events & Pics! Katy & George - ENGAGED!